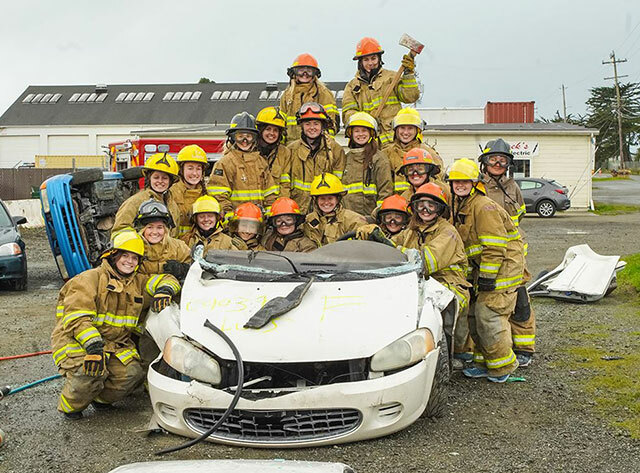 The HSU Women's Soccer Team spent a day training with the Arcata Fire Department as a team-building exercise. The Soccer team poses in firefighting gear. Photo by Thomas AllieAsk any coach and they will tell you that even though an abundance of talent is a solid indicator of a strong team it does not always transfer to success on the playing field. There is a reason why extremely talented teams sometimes underperform and why some lesser squads exceed expectations. Team chemistry is a contributor to the success of any sports program, and the interactions within the group lead to better communication and winning results. This is a philosophy adopted by the Humboldt State women’s soccer program and Head Coach Paul Karver. The preseason is a time to learn, for players and coaches, and it’s important to get the team excited before the season starts. In hopes to promote team bonding, Karver scheduled a day for his team to spend with the Arcata Fire Department. The event was a 13-hour day complete with fun and challenging events designed to develop leadership skills while also encouraging competitiveness. The day began with a locker room breakfast at College Creek Field with the team reporting at 5:15 a.m. before departing for the Arcata Fire Department. There to greet the team was A-Shift Battalion Chief Operations Sean Campbell, Fire Captain Angie Dernnedde, and Firefighter Luke Walker. Activities included a live fire demo, jaws of life demonstration, hose work, and firefighter rescue scenarios. The highlight of the event was an obstacle course, as players were split into groups of five and asked to work together as they navigated their way through the course. The teams each selected a group leader before getting dressed in full firefighter gear, complete with a breathing apparatus and mask that had a grey film over the eyes to simulate smoke. The group leaders went through the course first and then instructed their teammates through different obstacles. At the end of the course was a long, dark tunnel barely big enough for a human to crawl through on its hands and knees. After a complete day of exhausting work, the team felt a new sense of trust within the group as many players who weren’t chosen as team captains rose to the challenge and took on unexpected leadership roles of their own. After a successful event, the plan is to establish a partnership between HSU Athletics and the Arcata Fire District. With the 2019 spring schedule set to begin this Saturday, team expectations are high as the excitement of facing outside competition continues to build. Lumberjack fans can catch their first glimpse of the 2019 squad Saturday, April 6 with back-to-back games beginning with Lake Tahoe Junior College at 11 a.m. followed by Sierra Junior College at 1 p.m. at College Creek Field.